The Cryosphere refers to any place on Earth where water is in its solid form, where low temperatures freeze water and turn it into ice. The frozen water can be in the form of solid ice or snow and occurs in many places around the Earth in addition to the Arctic and Antarctic. 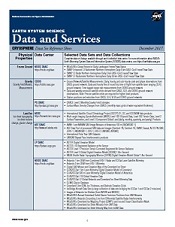 Earth Observing System Data and Information System (EOSDIS) Distributed Active Archive Centers (DAACs) provide cryospheric data sets provide information about land and sea ice, frozen ground (permafrost), and snow. The primary DAACs specializing in EOSDIS cryospheric data products are the National Snow and Ice Data Center DAAC (NSIDC DAAC) and Alaska Satellite Facility DAAC (ASF DAAC). Several other DAACs also hold cryospheric data as they relate to their respective disciplines. Learn more about Cryosphere Data at EOSDIS by reading Sensing Our Planet articles that feature research utilizing Earth Observing data from the EOSDIS DAACs and watch NASA Earthdata Webinar videos to learn more about NASA Earth science data sets, services and tools to discover, access and use these data. Explore, discover and differentiate between the nearly 500 NSIDC DAAC snow and ice data sets with the NSIDC data set search tool. NASA's Operation IceBridge is an airborne mission that collects a wide range of remote sensing measurements in the polar regions of the world. 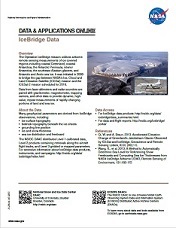 The National Snow & Ice Data Center (NSIDC) is managing the data archive for all IceBridge data, and so an easy-to-use Portal has been developed. 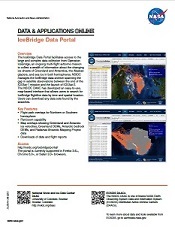 This webinar is designed to help users learn to navigate the IceBridge data collection and show them how to discover and access these polar data products using the data portal. This webinar will cover the objectives of the IceBridge mission and provide information about the wide range of available data.